Last month I was quite desperate for new make-up as I had completely run out of my foundation and eyeliner so as soon as payday came around - I was straight on the Boots website! 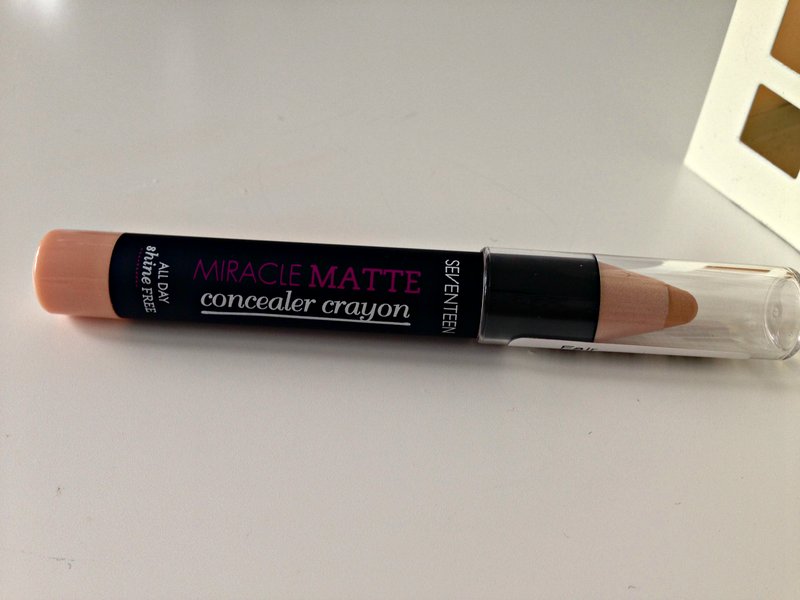 On top of the products that I needed, I also found myself eyeing up a few other new products and one of them was the Miracle Matte Concealer Crayon from my new favourite brand Seventeen. Because my foundation is quite thick and has what I'd say is a full coverage, I don't tend to apply concealer everyday. On the off days that I do swap my foundation, I do however need A LOT of concealer to hide my bags and horrible blemishes and I'm always on the look out for my "perfect" concealer. Since Boots had a "buy one get one half price" offer on all Seventeen products, I was one item down so it just made sense to order the crayon as well. Excited wasn't the word when my delivery finally arrived and I was quick to get the concealer out and test it out and of course I thought I would document my first impressions of it! Although I was really excited to recieve this concealer, I really didn't think it lived up to the hype I'd created. On my first attempt for using, a bit of the nip broke off which you already know is a great start! It didn't go onto the skin easy and it felt like you had to press down on the pencil quite a bit to get it to show on the skin - not good for the sensitive skin around my eyes! I didn't manage to get a picture of me wearing the concealer but I honestly didn't think it made much difference to my face at all. The only good thing I would say was that it seemed to last - but then again I couldn't even tell it was on my face so who knows! Overall I wouldn't rate this concealer at all, which is a bit of a shame as I love the rest of the products I've ever brought from Seventeen. I hate to be negative about certain products but I can't help not enjoying something. Maybe it's just me? You can read the original haul post here. Thanks for the review. Yeap, this doesn't look good. Not a good cover.